Our free-standing floor Tower adds customizable LED light to your indoor environment and includes a bluetooth speaker for stunning sound. 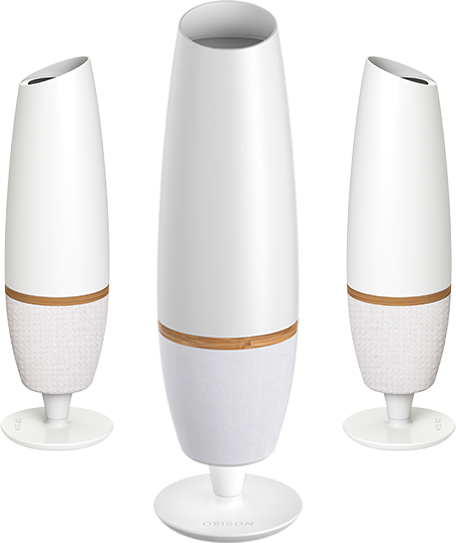 Orison Tower is a free-standing floor lamp for seamless energy storage, customizable to your home. Connect to your Orison unit via bluetooth and enjoy music through the Tower’s built-in sound system. Orison’s mobile app keeps you comfortable, knowing you have control over your usage and access to energy. Orison is expandable through supplemental units. The more units you add, the more resilient your power. Set the LED’s on your Orison to natural white, or choose from 16 million colors to light your room. Orison is mailed directly to you. Simply plug it into the wall like you would any other appliance. Increase your storage capacity with Orison Tower+. The more units you have, the more resilient your power becomes. If you have a large demand on a single circuit, you can expand your storage capacity on that circuit by plugging one or more Orison Tower+ into the Orison Tower. You can add up to five Tower+ units to an Orison Tower device for a maximum storage capacity of 13.2kWh per main device. Orison has a ten-year worldwide warranty. Your Orison will be supported for the length of the warranty, by an automatic replacement plan. Orison energy storage is 120-240V @ 50-60Hz compatible and is being designed and certified to work around the globe. We have received product reservations from all over the world. With production capacity limited in the early years, we invite you to join our waitlist. In-depth articles and FAQ’s on everything Orison. What’s included in the master Tower unit? The Orison Tower includes battery storage, power conversion electronics (inverter) and a smart networking and control system. There are no hidden fees. As well, the Tower features controllable LED lights and a Bluetooth speaker. Orison units will also be supplied with a power cord that has the appropriate plug for the location it will be used. What’s included in the expandable Tower+ unit? The Orison Tower+ includes battery storage. The expandable units leverage the power electronics and networking capabilities of the master unit. As well, the Tower+ features the same controllable LED lights and bluetooth speaker as the Tower. How does the Orison Tower play music? The Tower comes with a high-quality Bluetooth speaker to support popular media streaming sources. How do the Tower+ units work? If you have a large demand on a single circuit then you can expand your storage capacity on that circuit by plugging one or more Orison Tower+ into the Orison Tower. The + expandable units cost less by leveraging the power electronics and networking capabilities of the master unit. For example, a modern, energy efficient refrigerator/freezer uses about one kilowatt-hour per day so a single Orison Panel would keep it going for two days in case of a blackout. If you wanted to ensure longer backup, adding one secondary unit could extend it to four days. The number you install depends on how much energy you use per day and how many circuits you’d like to maintain operational during a blackout. You can combine a master Orison Panel with five Tower+’s for a maximum storage capacity of 13.2kWh per Orison Tower unit.